Once there was a land called Galicia, which straddled the modern-day border between Poland and Ukraine. During its long and bloody history, most of its population lived in poverty and trepidation. The most insecure of these were the Jews, whose Hasidic fervour, long centuries of residence and relative affluence (compared to their Polish and Ukrainian serf neighbours) proved to be of little avail whenever Jew-hatred raised its monstrous head. As we well know, the worst of these times was the Holocaust when, in despair, Szulem and Chana Kahane put their 4-year-old daughter Ester Hadasa into the care of a Polish family in the small Galician town of Zbaraz. Shortly thereafter Szulem, Chana and virtually the entire Jewish population of Zbaraz were exterminated. 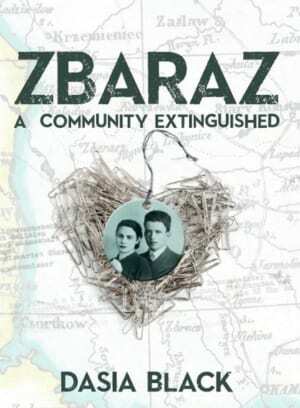 Zbaraz: a community extinguished is the story of the search by Ester Hadasa – now Dasia Black of Sydney, Australia – for further knowledge and understanding of the parents and place torn away from her. Equally poignant are the few scraps of information that Black could find out about her father and mother. These, together with the author’s imagination, enable her to build a sketch of the gentle and sensitive Szulem, a devout and intellectual schoolteacher. Sadly, there is insufficient information to bring her mother Chana to life. Fortunately, however, Black includes a pre-war photograph of her parents, the faraway look in her father’s eyes perhaps foretelling the future that awaited the Jews of Europe. 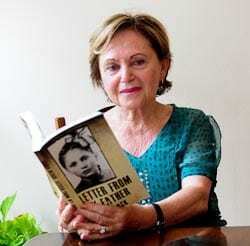 Black’s earlier book, Letter from my Father (2012), described by reviewer Marilla North in the Sydney Morning Herald as “… real, raw and very brave”, was a memoir, which looked at Black’s turbulent life in close up. It is an intimate, recalled experience. Zbaraz, however, is written from a greater distance. While partially drawn from memory, the latter work is largely informed by Black’s historical research and imagination. She is not a participant. There is a strong sense of restraint as if letting go would result in a never-ending flow of grief. Tellingly, Black recounts a visit to Yad Vashem in 2013 where she located her own testimony about surviving in Zbaraz in 1942-43. “I protested to the helpful librarian that I certainly had never handed in a testimony and it could not possibly be mine. But it was. I wrote it as a ten-year-old in Germany after the war.” Presumably Black was too traumatised to remember that terrible time. At her story’s end, Black’s search for her parents is only partially successful. Certainly their final moments remain a mystery and the author is forced to conclude, “I need to accept that this is the end of my search. Do I feel some kind of closure? I don’t think so. I do know that I need to live with not knowing. There is a sadness but also a depth of gratitude for these young people who gave me life and ensured that I survived and indeed flourished.” While no compensation for her suffering, Dasia Black’s quest has produced a testament to personal and Jewish fortitude that should be read by many.